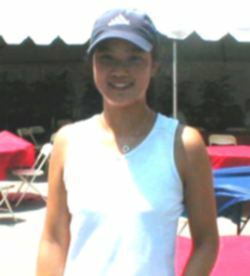 Amber Liu has held the top spot in the USTA National Girls' 18 Rankings for all of 2002. She earned that position after a 2001 that included winning the Girls' 18 Super National Hard Courts, being a quarterfinalist at the Easter Bowl, reaching the semifinals at the Singapore International Championships and playing the finals at the Malaysia International Championships. In the past few months, Amber has been playing the international junior and USTA professional circuits, winning one of the pro events and doing well enough in the juniors to climb to No. 22 in the ITF Girls' Singles Rankings. Eighteen year old Amber has already finished high school and is ready for the next step. If ever there was a use for "bright and bubbly" it would be as a description for Amber Liu. I sat down with Amber at the Apple & Eve Long Island Tennis Classic after she had beaten the No. 7 seed, Mi-Ra Jeon. (Amber lost the following day to Aiko Morigami.) She is confident and articulate as she talks about her tennis career. Q: That was a great match (against Mi-Ra Jeon). A: "Yes. It was a touch match. I haven't played that many Challengers this year so I'm just getting experienced. I try to stay in the match, stay with it and keep my cool." Q: What has been your focus this Summer? I noticed that you haven't been playing the USTA junior tournaments for awhile. A: "I haven't been playing those. I played them all last year and did pretty well, so this year I'm focusing on professional tournaments to see how I'll do at this level. Earlier this year I won a 10 ($10,000 Circuit event). That was a start."